Alhamdulillah, always asking to be nothing and enter the oceans of Allah’s Rahmah and Mercy, and then to be dressed by that Rahmah and that Mercy. Alhamdulillah, a reminder always for myself of what they want us to concentrate on and the ocean of reality to be dressed with. It requires so much repeating because of the depth of that ocean and the depth of that reality. That the mind hears and goes through the ears and out. But for those that are contemplating, it’s a constant contemplation, constantly contemplating that reality, to go deeper into that reality to understand, through the heart that reality. Mawlana Shaykh Hisham teaching that every reality is based on these three. Ulul amr representing a physical guidance but containing all of it within them. And that the obedience to the Prophet (sallallahu alaihi wasallam) is the stations of ‘iman’ (faith). The obedience to Allah ‘Azza wa Jall is the station of perfection, ‘maqamal ihsan’. It is to be perfected in the belief. Moving towards that understanding, they begin to teach us that everything is going to be based on that body, the light, and the reality towards energy and sound. It means that the secrets of guidance Mawlana Shaykh is always teaching that, “Come to the oceans of guidance and leave that which is fake.” Means leave the fake fruit and leave the fake associations that cannot explain these realities and cannot go into these realities. You find that they are a waste of your time; that they are a sense of entertainment for this self. 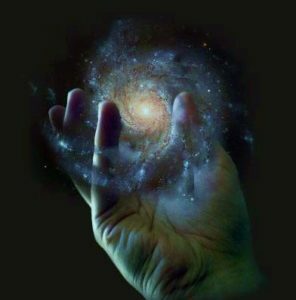 But the reality that they want us to understand, for us at this time to understand, is that for every form and every guidance based on form, for every form, there must be a light. That there is going to be a guidance based on the form. That has one value. 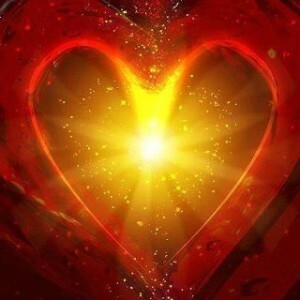 But for that form to be in existence, it has a light and what you are seeing is the light that is manifesting. It’s atomic reality, it’s molecular reality – the reason you see the form is there is a light. And that light has a guidance and the ocean of light has a guidance. 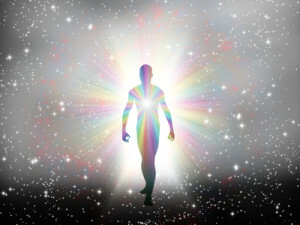 That light, to be existing, is coming from an ocean of energy. And that energy to be existing, must be coming from a sound. It must be coming from a praise and a resonance, what physics calls, or what quantum physics calls, string theory; what Allah calls ‘yusabbihu bihamdi’. That has its depth of ocean, that everything is in a praise. Allah ‘Azza wa Jal has everything existing in a praise. What they found in their string theory? That everything is moving, is resonating and the resonating is from within itself. It has a sound, causing a vibration; that vibration produces an energy, that energy produces a light and that light produces a form. In the material world people are busy with guidance of the form. And there are darajast (ranks) and understandings within the guidance of the form. That there are people who read something, teach you something, and only based on the form. That they cannot reach into the depth of the light, into the reality of the energy, and definitely not producing the vibration of that sound. That which is based on the form has its value but, you must seek that which is based on the light. 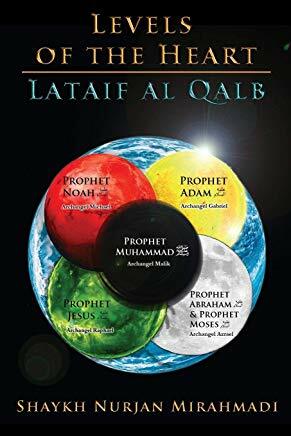 So what Prophet (sallallahu alaihi wasallam) descibed for ‘Islam’ (submission) and for ‘Iman’ (faith) and ‘Maqamul Ihsan’ (Station of Moral Excellence). Means that which is “Islam” is related to the form and perfection of the form and the highest reality of the form is ‘seek your Islam’, means submission. Submit your form to the reality of what Allah ‘Azza wa Jal wants to open within your iman, within your light. 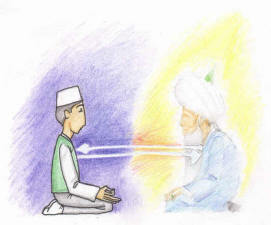 That’s why light that enters, and Maqamul Iman, the (Station of Faith), is described by nur (light). That the light of iman must enter into your heart so that you have been dressed with faith. It’s not something that you just automatically have. The station of iman is that you will experience an energy and a light that opens within the heart, and like a khashf, Allah ‘Azza wa Jal will grant a vision and many different experiences. That is nurul iman that begins to come and occupy the being and open the reality of the being. Then the Maqamul Ihsan (Station of Excellence) and the oceans of perfection are going to be based on the reality of sound. There is a guidance for the body, an understanding of the guidance for the body is on how to tarbiyah, how to train the body, how to discipline the body. Then you keep the company of those who have an understanding of that tarbiyyah, of that discipline- how do I train my body and discipline my body so that I can reach the higher guidance? These are the turooqs (spiritual paths), and ahlal-haqaiq, the ‘people of reality’, they exist as a rope, to bring and to fulfill Allah’s command of Ateeullah and atee ur Rasul and the Ulul Amr. Means the Ulul Amr are that rope guiding us back into that reality. That rope cannot be broken because we are now going to describe: the guidance of the body is like an imam who tells you, “Wash like this, clean your nose like this, give your zakah (charity) to this percentage.” They give all of the external understanding of Islam, and that has its limit and has its capacity in which to perfect yourself. That guidance can be many places. Then they begin to describe that the higher level of guidance already takes that guidance, they guide the body. But the guides of light, they have reached a state in which their light and their soul governs their reality. That Allah ‘Azza wa Jal has opened for them their soul, opened for them that light of their soul, and that light begins to interact with our being. That reality cannot come to anyone with a broken chain. So somebody says they read a book and now they are guiding based on light? It’s not the way. It’s not the way and it’s not the adab (manner) of Sayyidina Muhammad (sallallahu alaihi wasallam). The Prophet (sallallahu alaihi wasallam) and his companions, tabi’een and tabi’ tabi’een, (Followers and the followers of the followers), all of them kept the companionship and kept the rope to Prophet (sallallahu alaihi wasallam). There must be a a shajarah, there must be a family tree in which you are taking that light, that reaches to Prophet (sallallahu alaihi wasallam) like a wire, like an electrical cable. 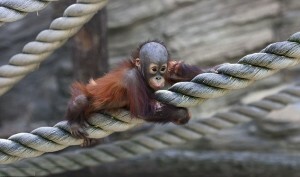 Like a hubl, a rope that is coming from Prophet (sallallahu alaihi wasallam) and was inherited down. And you are signed off, that now that cable comes to you. It is signed off by the shaykh of the shaykh and any other shaykh within that organization. They sign off that that cable has come from Allah ‘Azza wa Jal, and by authority of Sayyidina Muhammad (sallallahu alaihi wasallam) and is reaching to you. Now you are a guide of light. The guide of the body is the lowest. To tell you what to do on this earth is of the lowest dimension. It’s like going before Allah ‘Azza wa Jal and ask that, you know, “Ya Rabbi, I am coming here to Divine Presence. I’d like to know how to get more gas, from my gas station.” They will come to Mawlana Shaykh and ask for these types of prayers! That guidance is the lowest form of guidance. But what they are describing are the guides of light that they encompass the physical guidance. That is their kindergarten. emanates around them and they merely release their light. The concept of the soul is something we may not understand- that the soul is confined within the body but those whose hearts are open, Allah ‘Azza wa Jal opens the reality of their soul. One understanding is their soul, if they release it, can hold all of dunya within its hand. The magnitude and the size of the soul is not something we perceive. But if you want to understand the greatness of the soul, is, look to the vastness of this universe. 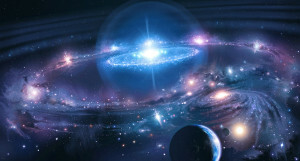 All of this universe with its infinite size is all existing within Nur Muhammad (sallallahu alaihi wasallam). All of its vastness, its unimaginable size must be in La ilaha illallah or Muhammadun Rasullullah (sallallahu alaihi wasallam). La ilaha illallah (There is no God but Allah), nothing, ‘la sharik’ there is no partner with Allah (swt). Means everything is within that light of Muhammadun Rasullullah (sallallahu alaihi wasallam) (Sayyidina Muhammad is the Messenger of Allah). We keep repeating it to understand it and to really contemplate it. The guidance of physicality? Very easy, that’s nothing. But for Allah ‘Azza wa Jal to open the reality of the guidance of light means they have trusted that servant with the ability to use their soul. 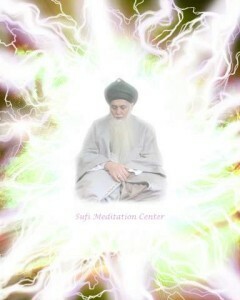 With little bit of studying of the atoms, you know that when the light moves out, their atoms are moving, their dhuriya. 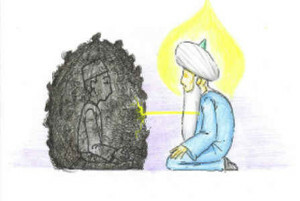 When the dhuriya is moving out, their atoms are moving out, their light is interacting with your light. Because light doesn’t stay by itself, it’s moving, it’s connecting. Immediately their atoms are grafted onto your soul, and your soul is grafted onto their soul. Whatever zikr they are doing, whatever practices they are doing, whatever lights from Ateeullah, ‘Ateeur Rasul, wa Ulul Amri minkum – Obey Allah, Obey the Messenger, and those in Authority” (Holy Quran 4:59). Whatever Allah is dressing Prophet (sallallahu alaihi wasallam), whatever Prophet (sallallahu alaihi wasallam) is dressing those ulul amr. The real ulul amr, are 124 000 awliya. What Prophet (sallallahu alaihi wasallam) is dressing them, their dhuriya, their atomic reality is taking that dress. And because there is no ego, their atom freely sends to the level that the other atoms can take. They send it light, send it blessings, send it energy and tajali (manifestation). It’s sending it energies, and frequencies. That atomic reality that you have is being dressed by their soul, blessed by their soul. That’s why they don’t need you to do very much but just attend. As you attend, more light can be placed onto you and more of your light can be put onto them and they begin to carry that burden. What Allah ‘Azza wa Jal describes from the heart of Holy Qur’an because this guidance of light is based on nurul iman, the light of faith. Nurul iman has to do with love of Sayyidina Muhammad (sallallahu alaihi wasallam). 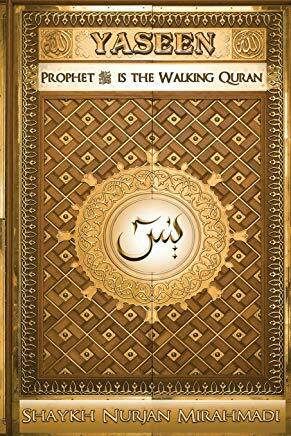 The heart of Holy Qur’an is Sayyidina Yaseen (saw). So Allah ‘Azza wa Jal said, a sign for them, “wa hamalna dhuriya’tuhum – We have carried their atoms” (Quran 36:41). ‘We have carried them.’ We talked about that before but to repeat it because people don’t seem to be understanding the depth of what they are describing. When we say in tariqa, ‘fana’ (annihilation), I’m in the muhabbat of my shaykh and then entering the fanaa of my Shaykh, it’s not your body and body are coming together. They want us to think out of the box, that your souls connect. And they don’t need your approval. If you are in that attendance, it’s enough for them and their light to begin to move and capture light. The reality of the atom is if they take an atom from you and bring it out, physicists found you don’t become something new. It’s not a new creation. One out of your trillions of atoms, one of them, if they take out, all of them communicate back to you. It’s not like you took something and it became something new. Quantum physics found that if we take an atom- there may be billions of atoms in this glass of water- if we take one atom, all of them communicate together. So it’s enough that they take one atom: “wa hamalna dhuriyatuhum” (Holy Quran, Ya Sin 36:41). Allah ‘Azza wa Jal says, “We carry you, We have always carried you”. It’s enough if they carry from one atom. The conveyance of energy from their atomic reality, from their light reality, completely dresses that atom, completely blesses that atom. It means that there is something happening in the world of light here in these associations. We are not physical boxes and we’re not couches and sofas sitting here. You go to other associations and maybe they all look perfect on the outside. Because there is not a guide of light amongst them and they focus only on the zahir, only on the outside. That’s like a clock that may not have an engine and if it has no engine you don’t really know what time is it? Means the inside could be khali, could be empty; but they just focus on the outside. What the guides are teaching, the outside is the easiest. Do the outside, you can find that anywhere. If you have ittibah and follow, you will follow perfectly your outside, your shari’a will be perfect if you follow the guides of light. Their soul carries the light of everyone they come in touch with. They like it, they don’t like it, it’s not up to them. Allah ‘Azza wa Jal merely sends something into their presence and those atoms cling to that light. Now, in the world of light, we begin to understand what is fana? What is the station of fana and annihilation is that if you can bring down your physical ego and your physical understanding. Annihilate your physical reality that, ‘my form, ya Rabbi, is nothing, I’m not interested in my form. My form is going to go into the dirt. Ya Rabbi, let me to understand from the world of light.’ As much as you annihilate your form, annihilate your form, you begin to reach your atomic reality. 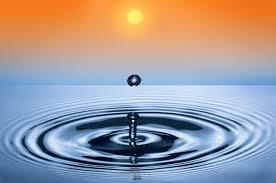 You begin to think that you are something greater than just this form, means you realize there is an ocean and I’m keeping myself as a drop, and there’s no power in a drop. As soon as the drop goes back into the ocean, it can begin to sense, it can hear everything. 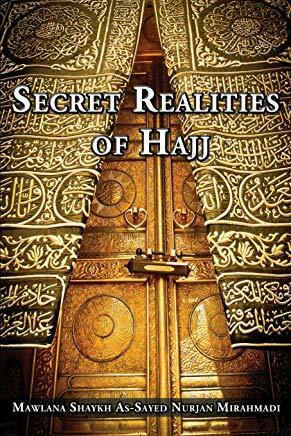 Allah ‘Azza wa Jal says, “I’m going to dress you from My hearing.” That is the ocean of reality. Your ears don’t hear beyond this because we are stuck in the form. The guides of light, when their souls touch, they are dressing the atomic reality of everyone, as they are being dressed by their shaykh and their shaykh by their shaykh, and their shaykh by their shaykh: they have an internal structure. And that structure is a form of light and energy that moves across the earth. As their shaykh is moving, their atomic reality been dressed by everything their shaykh is being dressed by. 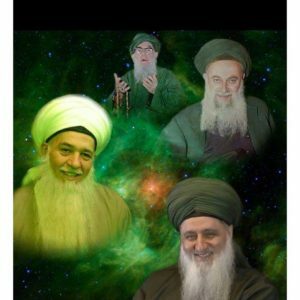 As their shaykh is moving on a mi’raj (ascension), they are moving on that mi’raj. All shaykhs and all ahle haqqaiq (people of reality) are moving in their mi’raj, in the mi’raj of Sayyidina Muhammad (sallallahu alaihi wasallam). As they are moving, all light is moving. Means, as they begin to dress us and bless us, they begin to teach us, “Think from the world of light,” that: “destroy your form, annihilate your form. Understand that the associations of light are not comparable to any other association.” You can sit a thousand years somewhere else, it doesn’t mean anything. It’s enough that every time you sit in that association, their light is grafting through your light, and your light is grafting through their light. They are able to dress and bless that atomic reality that will reach to you. You begin to sense that energy, your love for Sayyidina Muhammad (sallallahu alaihi wasallam) increases. Because the identity of that light is the love of Prophet (sallallahu alaihi wasallam), it’s not their individual identity. Their identity died with the form- all there is, is the love of Sayyidina Muhammad (sallallahu alaihi wasallam). 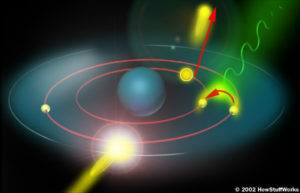 The light we are talking about is the Muhammadan light that is moving out. When you begin to sense that in your soul, “My love for Prophet (sallallahu alaihi wasallam) is increasing.” It’s not from you. It’s from their light that they have transplanted onto your light. You may begin to sense Prophet (sallallahu alaihi wasallam), feel Prophet (sallallahu alahi wasallam), smell Prophet (sallallahu alahi wasallam) and begin to see Prophet (sallallahu alaihi wasallam), through your heart, through your light, but it’s why? It’s because the guides of light, they are moving their light into your being. As much as you annihilate yourself out of the way, as much as the Muhammadan reality can begin to move in. These are the guides of light. Then they describe above the guides of light, there are guides who have been granted the permission to guide through the oceans of sound. Again you have to study the physics: that for every form, there is a light; every light, there is an energy, and then a sound. In dunya (material world), because you are going to start seeing this from shaytan, so you have to learn this from Rahman (the Most Compassionate). 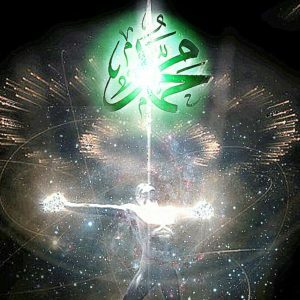 In dunya, shaytan is going to release energies and weapons that are based on energies, weapons that are based on light. So it’s not something that does not exist; it’s now moving into this dunya. The Chinese have a laser that shot from dunya to 270 miles into space, and they took out a satellite. This is the ocean of light. This is the reality of light. Zahooqa, Allah ‘Azza wa Jal describes “it obliterates everything that’s false”. What? The haqq of Allah ‘Azza wa Jal’s light, which is the haqq of Nur Muhammad (sallallahu alaihi wasallam). When that haqq comes, it destroys everything false and begins to replenish your life back to its haqq and back to its reality. But then we go out and sin, and we do bad things again and throw more dirtiness upon that light. Those who succeed, they constantly try to purify themselves, perfect themselves, lessen the amount of sins and bad actions, so that their lights begin to change. The reality begins to change. That for everything is in a praise. When the guides are given permission to intercede, when they have been given from the reality and the guidance of sound, means that they reached a level of annihilation in which they annihilate themselves back into the ocean of light. Then from the ocean of that light, they annihilate themselves back into the oceans of energy. And from the oceans of energy, they annihilate themselves back into the oceans of Qul Hu, (Quran 112:1), back into the ocean of sound. “Say He is Allah, the One.” (Holy Quran, Surah of Sincerity 112). 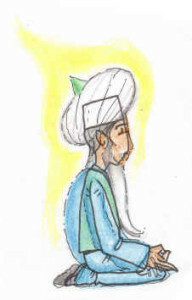 Qul Hu, from the “Surah of Sincerity”. These are Allah ‘Azza wa Jal’s sincere servants. That as soon as they enter the ocean of that zikr, they are annihilated back into a sound. If they are able to reach towards that reality of sound, means that what emanating out from them is a sound. And if that sound begins to hit your frequency, they begin to change your frequency. If they change the frequency in which you are operating at, you begin to change the light and the spectrum of the light of people. That is what’s meant by intercession. When they describe Prophet (sallallahu alaihi wasallam) will be granted intercession on the day of judgement. Because the understanding is not yet ready to understand, they describe it as Prophet (sallallahu alaihi wasallam) would be making a du’a (supplication). He is liwa wal hamd (sallallahu alaihi wasalaam), means he is the flag of Allah’s praise. He is the reality of Allah ‘Azza wa Jal’s divinely Word. He is the reality of Allah ‘Azza wa Jal’s divinely Tongue; that nothing can hear Allah ‘Azza wa Jal, and all that they can hear is the praise of Sayyidina Muhammad (sallalahu alaihi wasallam). wouldst have seen it obliterated to dust (from its power)…(Quran, The Exile 59:21). That sound has to pass the reality of Prophet (sallallahu alaihi wasallam) to become cool and peaceful, as to not destroy and obliterate creation. So means that Prophet (sallallahu alaihi wasallam) is going to make a sound but for people we say, “Oh it’s a du’a”. What’s the reality of a du’a? They say a du’a that nobody has heard. Means Prophet (sallallahu alaihi wasallam) merely begins to release a frequency. That the hamd and the praise from Prophet (sallallahu alaihi wasallam) is such a powerful “sayhatan wahidatan” (Holy Quran 36:29), that it’s but one shout, and they are destroyed. Means the sound that emanates from Prophet (sallallahu alaihi wasallam) will obliterate everything false. Everything that’s standing on the day of judgement in its false realization, in its false character, not the way that Allah ‘Azza wa Jal wanted it. We are coming with all the animalistic form. It’s but one shout from Prophet (sallallahu alaihi wasallam), and everything false will be obliterated. But because it’s heavenly, it’s not destroyed. Every false will be obliterated and make another praise and everything will be brought back towards its reality. That is, everything is already existing based on sound. It has a sound, based on the sound it has a light, based on the light it has a form. It means the intercession and the reality of intercession is going to be from the hamd حمد (praise) and the sound of Prophet (sallallahu alaihi wasallam). That’s why the name Muhammad محمد is the reality of sound. 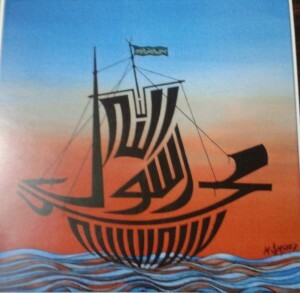 MuHammd – the most, meem م of the hamd حمد , the most praised in Allah ‘Azza wa Jal divinely Presence. Ah, with the alif ا and hamd احمد means that he has even a divinely praise from Allah ‘Azza wa Jal, granting the reality of the name of Sayyidina Ahmad احمد (alaihis salaam). We pray for more understanding, to understand and open the heart and to leave the world of form and not be locked into the box of the form. That the greatness is in the oceans of light, and from light there’s the energies and sound. Then we begin to understand the importance of the dhikr, the importance of salawat on Prophet (sallallahu alaihi wasallam). Everything that the guides are teaching us from the ocean of the soul is based on sound. Every durood shareef, every salawat, every zikr that you are making is affecting the sound and the vibration in which we are vibrating at. If we change that frequency and raise it and raise it and raise it, you will see a difference in the light that you emanate. If no frequency, the light spectrum is low. If you raise and elevate the frequency in which you are praising, your light should reflect that frequency. That’s why the two, they don’t meet. Angels and demons, they don’t meet because the frequency is such a high frequency and the one is so low that there’s no meeting point: they basically obliterate. 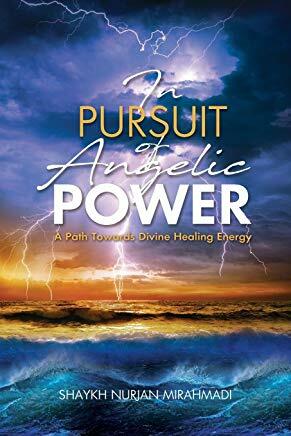 If the angel comes and the angelic frequency comes, it obliterates everything that’s false, and destroys it and will re-raise it to something that is true. We pray that Allah ‘Azza wa Jal grant us an understanding, grant us more understanding of annihilation, annihilating ourselves and entering into the oceans of light and guidance of light, guidances of sound and the importance of sound.